The Castello di Bossi is located in the commune of Castelnuovo Berardenga, on the road that leaves the old Chiantigiana road, at Pianella, and ascends to Brolio amidst evergreen forests and long rows of vines. With its centuries-old trees, its fossil beds, and richly varied native vegetation, this unique spot has always aroused curiosity, even in remote times, and experts have studied its characteristics. Pronounced aromatics and a developed and layered palate of berry fruit, spice, leather and tea leaves. Vibrant acidity, well integrated tannins and an incredible balance of components make this a polished and elegant wine to enjoy now or cellar for years to come. 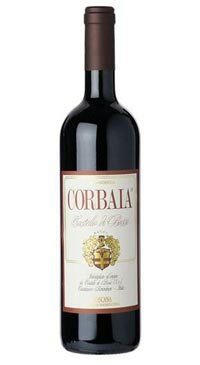 The 2012 Corbaia is an exhilarating wine that offers pleasant surprises in a lackluster vintage. The blend is 70% Sangiovese and 30% Cabernet Sauvignon that is aged in aged in French oak for two years. I am delighted by the inner energy and tonic firmness of the mouthfeel. In terms of texture, Corbaia offers unique quality. Dark fruit and integrated spice add a lasting sense of lift and buoyancy.